I love strawberries. Especially fresh garden strawberries. Mine have already had one bearing and are full of flowers right now just waiting to turn into berries. I can't wait. But to enjoy them when I don't have them growing in my garden is difficult because it is hard to come by organic strawberries that aren't $6.00 a container. Luckily Whole Foods had a special one day for 1.99 each! You can probably guess, but I bought $50.00 worth. I froze them and I am hoping come winter there will still be plenty in my freezer to enjoy when berries are out of season. I decided to try out a no bake strawberry tart, perfect for a hot afternoon, with some of them. I loved it and after my fabulous taste testers gave their approval I knew it was a hit! In a food processor, chop pecans until they resemble meal. Add the honey, coconut butter, coconut oil and salt until the mixture starts to form a ball. Put the mixture in a tart pan (with removable base). Using fingers, press so the mixture evenly coats the bottoms and sides of the tart pan. Place in refrigerator while you are working on the filling. In a processor, chop strawberries until they pureed Pour the puree into a bowl and then fold in the coconut whip cream. 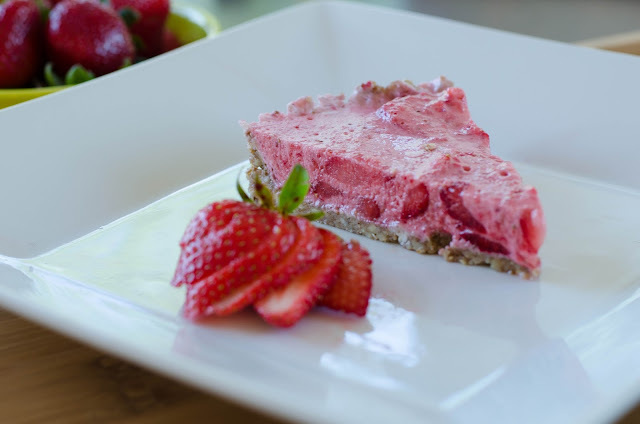 Once the strawberry puree and coconut whip cream are mixed, fold in the diced strawberries. Pour the mixture in the tart mold and put in freezer for about an hour so that it starts to harden. Remove, cover with plastic wrap and then return to freezer until you are read to serve it.